Madness is in the mind of the beholder. We're at the cusp of a sea-change in how our minds are perceived. Up until this moment, this day, this hour, we've had two very different means of understanding our own brains. On one hand, there is the crude physical organ, which Mad magazine once referred to as resembling "a bloody sponge." On the other hand, we understand the brain, the mind, to be the psychological image of our own identity. Body and spirit required different forms of treatment. What ailed one certainly could affect the other, but treatment could be pretty neatly divided into talk therapy and brain surgery. In 2009, New York Post reporter Susannah Cahalan found herself straddling that line, then crossing back and forth. Soon enough, she found herself disconnected from her own story, her own self. Fortunately, she was one the right side of the dividing line in our understanding of the mind and the brain, and was able to return to her storyline and her right mind. The story of Cahalan's loss of her own story is easily the most terrorizing book you're going to read this year. 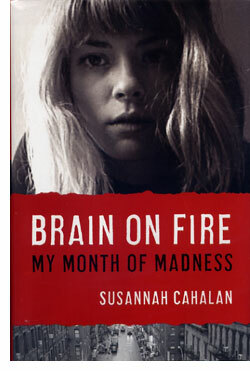 'Brain on Fire: My Month of Madness' manages the very difficult trick of putting us in the mind of a woman who is losing her mind, her very soul. Cahalan's book is a journey to the center of the human inferno, from which she returned only by virtue of the love of her family and friends and her excellent medical treatment, which might not have been possible a mere two years earlier. Cahalan has a fantastic story to tell, so it is easy to miss out on just how well she tells it. In early 2009, she noticed what she thought was a bedbug bite, in the midst of a bedbug scare. She herself grew scared and then obsessed. In hindsight, she's able to understand and convey that it was the obsession, not the "bite" which was the symptom of what was to come. As her behavior grew increasingly erratic, she ended up in the NYU Langome Medical Center, in the direst of conditions. Her life, as well as her mind, was at risk. A team of doctors, and one in particular, made the difference, bringing her back from the lowest circles of a mental hell. Cahalan tells her story in crisp, intense prose and short, sharp chapters. The narrative is just about 250 pages, and you're likely to read it in one or two terrified sittings with your hands clutching the book. She does a superb job of conveying just what it is like to lose control of your own thoughts and emotions. She's brave and raw in what she tells us, but doesn't go overboard with details for the sake of shock. Instead, every word is there for a reason, as she takes the reader on journey where we can see the evidence of her illness, while she, the narrator telling the story, cannot. This is powerful, crafty writing that gets under your skin and induces a reading experience version of the panic the narrator is describing. The structure is equally graceful and powerful. Because of her illness, Cahalan does not have any memories of substantial portions of the events she narrates. She had to go back to her medical records, videos taken while she was in the hospital and the memories of those she knew to re-create the events and characters in her life. In this kind of story, there's a real danger of prematurely conferring sainthood on one's family and friends, which undermines the veracity of the entire enterprise. Cahalan manages to avoid doing so while clearly conveying the import of the love and support that were critical in her recovery. This is also true when she writes about her doctors. 'Brain on Fire' is a quintessentially human story, and leaves doctor-gods at the door, showing us professionals who find themselves flummoxed by a combination of creepy, invasive, shifting symptoms and a disease that is only barely understood. Cahalan keeps the science smart and comprehensible. This is not a book about a new disease; it's a book about being on the razor-edge of how we understand ourselves. Ultimately, it is that definition of humans as the storytelling species that is the source of much of this story's power. Ten years ago, Cahalan might have ended up in a madhouse, with a diagnosis of psychiatric mental illness and a short life expectancy. Fortunately for her, and for us as readers and humans, she was on the right of the blade of progress. This is an intense book that deserves to be experienced in the same manner Cahalan experienced her illness, with as little preparation as possible. 'Brain on Fire' is a reminder that our own brains are fragile, our lives are finite, and our minds are capable, in spite of all this, of great knowledge, great love and great stories.